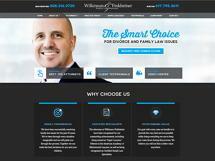 Wilkinson & Finkbeiner, LLP, is an accomplished family law firm Massachusetts. Our mission is to deliver quality, cost-effective services to help people through the legal challenges that accompany family-related life transitions. We provide results-focused guidance in a compassionate, respectful setting. The firm's founders are experts in family law. Our narrow focus gives us a high level of mastery in this often complex field. We offer professional guidance for those facing divorce, child custody, child support disputes, post-judgment modifications and more. We believe that your situation deserves a unique strategy tailored to fit your needs and objectives. We are well-positioned to offer whatever type of guidance you may need. Our attorneys offer legal advice for amicable, uncontested matters. We also provide mediation and litigation services for contested matters. Through handling hundreds of cases spanning all layers of complexity, we have built up an enviable foundation of experience. This background equips us to treat your matter with the individualized approach that is so essential to success. The first step doesn't need to be difficult. Call our office to arrange a free, confidential consultation with one of our experienced lawyers. You can expect to come away with a better understanding of your options on the road ahead.